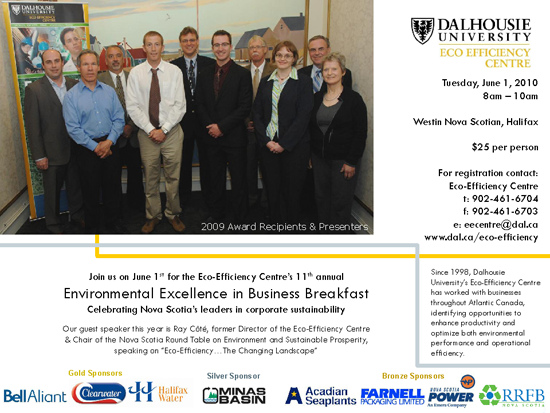 The Eco-Efficiency Centre is hosting our 11th Annual Environmental Excellence in Business Breakfast on June 1, 2010 from 8-10am at the Westin Nova Scotian. Our guest speaker this year is Ray Cote, former director of the Eco-Efficiency Centre and Chair of the Nova Scotia Round Table on Environment and Sustainable Prosperity. Ray will be speaking on Eco-Efficiency...The Changing Landscape. Seats for the breakfast are $25/person, a table of 8 is $175. To register please email eecentre@dal.ca or call (902) 461-6704.